I’m kind of like a samurai. They say if you want to be a samurai, you can’t be afraid of dying, and as soon as you flinch, you get your head cut off. I’m not afraid of losing this business. 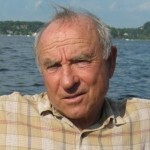 Yvon Chouinard is a rock climber, environmentalist and outdoor industry businessman, noted for his contributions to climbing, climbing equipment and the outdoor gear business. His second company, Patagonia, is known for its environmental focus. According to Fortune magazine, Chouinard is arguably the most successful outdoor industry businessman alive today.